Southern Mutual Church Insurance is committed to providing new ways to serve our policyholders. We are pleased to offer online payments via your church's checking account as one of these convenient services. When you click on the icon below, you will be taken to the secure website of our payment partner VeriCheck/USA ePay. 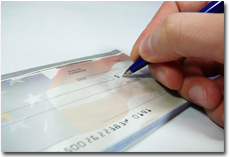 On the secure form you will enter your account holder name, bank routing number, and bank account number for your checking account. If you are on our Consolidated Billing option, you will enter your SMCI customer number, otherwise you will enter your SMCI policy number. You will also enter the amount you are paying, as well as your church's billing information (church name, address, etc.). When you click on the "Process Payment" button, you should receive a confirmation number verifying the payment request has been received. Please print this confirmation information for your records in case you need to contact us concerning the online payment.